In the course of EUPORIAS, many insights have been gained on the quality of seasonal forecasts and the value in supporting end-user decisions. Also it was shown that information on forecast quality in conjunction with the actual forecasts is needed to maximize the benefit of such forecasts to users. Since predictability and skill are highly variable in space and time, a comprehensive overview of forecast skill is necessary to allow users to identify when and where skillful forecasts can be used in what way. We have compiled a comprehensive overview of forecast quality of the seasonal forecasts of the ECMWF System-4. Monthly and seasonal averages of temperature and precipitation for all 12 forecast start dates and lead times were verified against the ERA-Interim reanalysis using a set of verification metrics. To explore the space-time variability of forecast skill and to engage with users, we have developed an interactive web application. This comprehensive assessment of forecast skill shall serve as a compendium to be consulted along with the corresponding real-time operational seasonal forecasts. 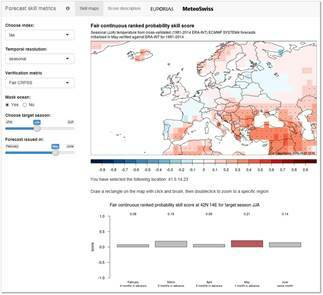 We hope that it will support users in their work with seasonal forecasts also beyond the EUPORIAS project. We only show skill scores for monthly and seasonal mean temperature and precipitation. Regarding user oriented quantities, such as heating degree days, it has recently been shown by WP22 in Bhend et al. (2016), that the skill in predicting mean quantities can be used as an upper estimate for the predictive skill in climate indices.